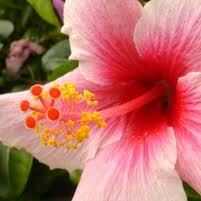 Jack Frost nipping at your – pink hibiscus? Jack Frost is on his way! My friends in the Pacific Northwest report snow, we’ve got a frost and freeze warning here in the Sacramento Valley during Thanksgiving week. On a quick photo assignment up valley to Gridley rice country, big rigs hauling firewood boomed past me on the highway, heading to the cities. Long-range weather forecasters are predicting a cold winter ahead – but they hedge their bets by saying it’s a La Nina year and it could be normal or on the dry side. Whatever! It’s cold and time to bundle up, which also includes the garden. 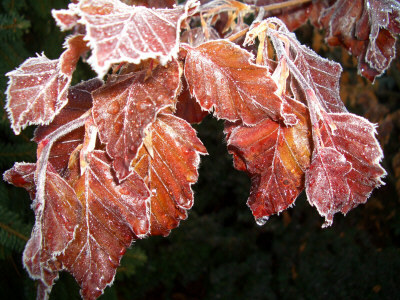 As we move toward winter don’t forget to stock up on supplies to protect your garden from frosts or killing freezes. Start with the simplest and best protection there is – water plants to make sure they’re plumped and ready. Don’t forget potted plants and those under eaves. My hot pink hibiscus, for example, is under my patio sun cover. It has been raining cats and whippersnappers, here. About 2 inches this week, according to my garden rain gauge. But my protected hibiscus missed the splash. The experts tell me the single most important thing I can do to get my hibiscus through the cold months is water it before the frost hits. Beyond just watering, there are ways to dress delicate, valuable plants that help them survive the cold. Frost fabrics offer a few degrees of protection and can be left directly on a plant for up to 6 weeks. The folks at Frost Pro-Tek have designed a line of bags and tarps that are relatively inexpensive and can be used for several seasons. They also offer a micro-perforated plastic sheeting that can be draped over plants or over rows of seedlings if you’re doing a winter vegetable garden and also protect against foraging birds and hungry bugs. You can find them at Home Depot. 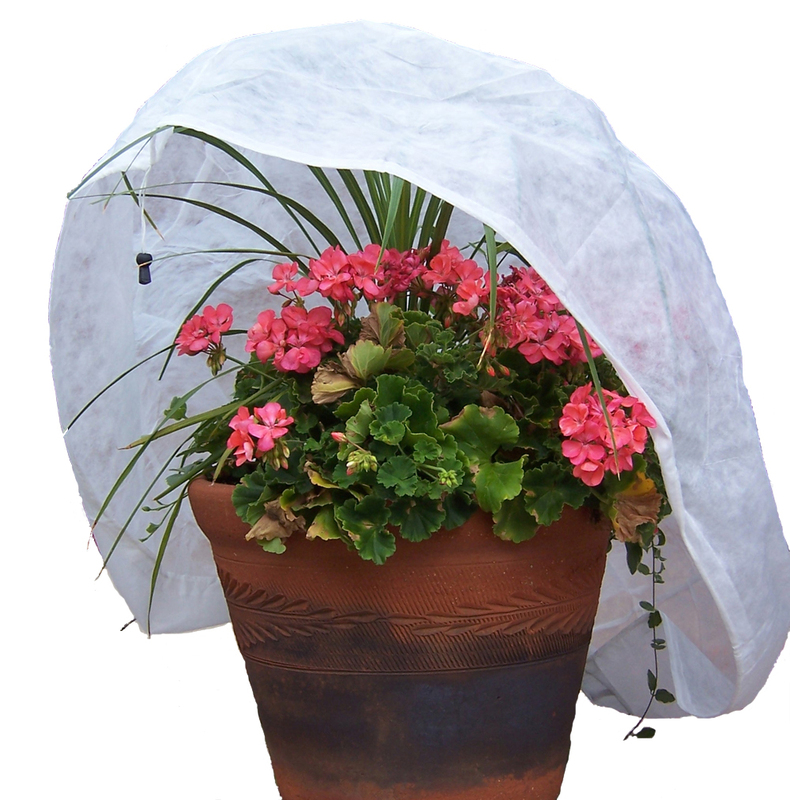 If buying frost protection fabric isn’t on your holiday shopping list, on frosty nights you can use bed sheets or light blankets for cover, Hill Billy-style, along with tarps, but you must provide a structural support for them so they don’t touch the plants. I salvage limbs from my spring and summer pruning – strip off the small branches and leaves and use them as stakes and poles. My garden looks like a train yard hobo camp. Because home wraps don’t breathe and can get heavy, they must be removed every morning and replaced in the evening, which can be a pain when you’re busy. What should you plan to protect? In California, hibiscus and bougainvilleas top the list of tender sub-tropical garden plants that need to be kept cozy. Mandevillas and stephanotis are frost-tender vines. Citrus (especially limes and grapefruit), avocados, and bananas will benefit from protection. When in doubt about the level of frost protection needed, check your favorite gardening book or the Master Gardener Web site. For more frost protection ideas and tips, talk to the experts at your local garden center. Silicon Valley’s Yamagami’s Nursery has frost protection tips for their area online.